Retro City Rampage REALLY Goes Retro: 486 – MS-DOS / Windows 3.1 Version Now Available | "DESTROY ALL FANBOYS!" Vblank Entertainment’s head honcho Brian Provinciano is a truly mad genius in the best possible way. 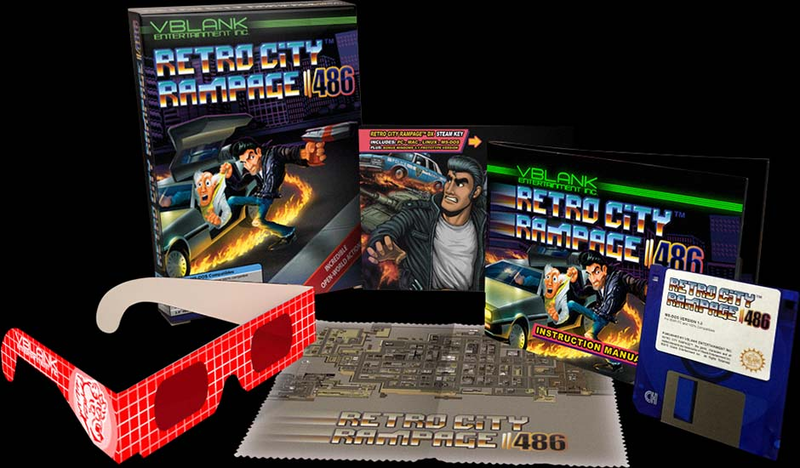 His single-minded obsession with his hilarious “retro” game Retro City Rampage has led to it being released on PC, Mac, Linux, PlayStation 4, PlayStation 3, PS Vita, Xbox 360, Wii, Wii U, and Nintendo 3DS over a few short years. Now, he’s gone and reprogrammed the instant classic and has gotten the game onto a 3.5″ floppy disk for 486 computers along with a Windows 3.1 prototype as a free bonus. If you still have an old PC lying around with a floppy drive, you can (and should indeed) snap up one of the limited edition boxed versions (there were only 1000 total made) and prepare for a nostalgic trip down memory lane with a game that probably wouldn’t have existed back then and if it did, it would be hailed as a fine slice of comic genius or something like that. If you happen to own the more modern PC version of the game already and bought it from the developer directly, guess what? You should probably check your Steam account for a nice freebie surprise. Everyone else, run or click like the wind HERE and hope for the best. Like the PS4 and Vita retail editions, this will probably sell out ridiculously fast. Yes, the game will also run on DOSBOX if you have a newer PC. I almost forgot to mention this, so now you don’t need to hit up eBay looking for some aged system to run RCR 486 on. This entry was posted in 2015, Commentary, DAF, Humor, Updates and tagged 486 MS-DOS, BUY This Game, Classic Video Games, Gifts, Indie Games, Indie Gaming, Linux, Mac, Microsoft, Nintendo, Nintendo eShop, Nintendo of America, Nintendo Wii U, Nostalgia, PC, PC Games, PlayStation 3, PlayStation 4, Playstation Network, PlayStation Vita, PS3, PS4, PSN, Retro City Rampage, SCEA, SEN, Sony, Vblank Entertainment, VGA 101, Video Game Appreciation 101, Video Game Trailers, Windows 3.1, Xbox, Xbox 360, Xbox Live Arcade by geelw. Bookmark the permalink. This is outstanding 🙂 What a fun idea. I was going to buy it but at $45 USD with shipping it’s too expensive for me. That would be $59 CAD. But it’s still an amazing product and I’m sure I’ll regret it later. I was also considering the vinyl record but it’s sold out. I’ll have to be content with my PS4 physical edition! You are an amazing source for news geelw!! Yeah, I was looking at the $30 USD option. I’m trying to be strong and stay focused on the few systems I like most.